In 1947, Lenore and Walter Dinsdale (born 1916) were married and continued their studies at the University of Toronto where Lenore received a Degree in Social Work graduating in 1948, and Walter received a M.A. of Sociology. In 1951, Walter was elected as a Federal Member of Parliament for the Brandon-Souris con­ stituency, serving for thirty-one years. During this time, he served from 1960 to 1963 as the Minister of Northern Affairs and Natural Resources and some time as the Dean of House of Commons. Walter passed away in 1982 and Lenore continues to reside in Ottawa. Their five children are, Gunnar, Gregory, Eric, Rolf, and Elizabeth (Wotton). Leonard, born 1931. (refer to Gusdal, Leonard and Doris). Delmar, born 1934, graduated from Brandon College in 1955 with a B.A. degree and later studied in the United States, France and Germany. He received his Doctorate of Theology, and Historical Theology in 1973. Delmar married his high school sweetheart, Miriam Nystuen, daughter of Pastor and Mrs. Nystuen. Miriam, a graduate of Bemidji College, Minnesota, continues as an elementary school teacher. Delmar has served in Lutheran Parishes at Minneapolis, Chicago and St. Petersburg, Florida where he, Miriam and four children, Leif, Jonathon, Nolan and Elisa, reside. Delmar is an Executive Officer of the Lutheran Ministries of Florida, a social service agency working particularly with new immigrants from Cuba, Haiti and the boat people from the Orient. He also directs continuing education programs for lay and clergy through the International Lutheran Council on Continuing Education. The family return to their cabin at Ditch Lake and enjoy the tranquility away from the city. 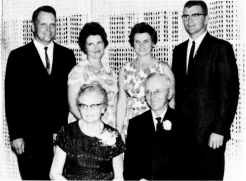 Left to Right: Leonard, Martha, Lenora, Delmar, Nellie and Ludwig Gusdal. Happiness is best attained by learning to live each day by itself. The worries are mostly about yesterday and tomorrow. "Praise the Lord for a new day". "Tune my heart to sing Thy praise". as ifreluctant to start another day's work. In the house things have come to life too. The hum of the cream separator dying down. the days never seem long enough. surrounded by God's wonderful creation. The children are home from school. The usual evening chores done. Man and beast are at rest. There is a faint glow in the west where the sun has set. All I hear now is the hooting of the night owl and the distant sound of traffic on the highway. And the moon shines like a benediction over MY VALLEY. Leonard Bruce, born 1931, elder son of Ludwig and Nellie Gusdal, attended Brandon Agricultural Centre receiving a Diploma in Agriculture in 1950. On November 10, 1956, Leonard married Doris Lorraine, daughter of William and Catherine Clym. After residing in Winnipeg for thirteen years and Brandon for two and a half years, they returned to Erickson to operate the family farm.